The style with a smile so big there's room for all your text inside. The smile is on the face of a pumpkin, and sprinkled around are brightly colored little wrapped candies and candy corn. Or bats and spiders, or stars and moons, depending on what you choose. Or maybe you want them all. Change the background color and the art changes as well; order this design in each color and get all the backgrounds! Customize your Jack-o-Lantern tags today! These Jack-o-Lantern favor tags are printed on extra-thick cover weight white paper and come in a variety of shapes and sizes (diamond, circle, heart, square, scallop-edged circle, ovals, and other more intricate shapes). 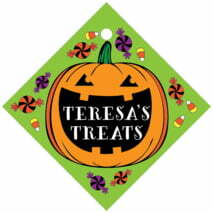 The Jack-o-Lantern favor tags come pre-punched with a small round hole to thread your choice of tie material. They are punched out individually and packaged as a set in small bags. At Evermine, we've put a tremendous amount of thought into our packaging, material quality and lovingly created designs to make all your products and gifts perfect. 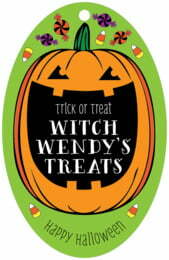 Have fun personalizing your Jack-o-Lantern favor tags today!